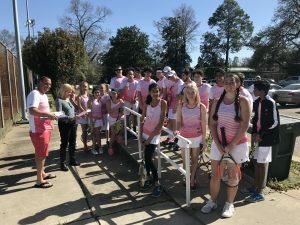 CMHS offers Girls and Boys Division II Varsity Tennis teams. Based on Regional Division Results, CMHS has hosted the Regional LHSAA tournament several times. In 2016/2017 Boys placed 1st place in Regionals and 3rd place at State. The girls placed 3rd in Regionals. Tryouts take place in mid-September and results are posted at the end of tryouts. Practices: Practices start in September on Mondays and Wednesdays from 4:00-5:15pm on the school tennis courts until the Spring Season starts. Once the official season starts, matches will be after school on Tuesdays and Thursdays. Practices will remain on Mondays and Wednesdays. Athletic Sport Packets: Required by the LHSAA, these packets should be completed and turned in prior to tryouts for both new and returning players. You cannot practice until all forms are turned in. Uniforms: Athletes purchase and keep uniforms. Every year we order jackets for the newcomers to the team. If returning players wish to purchase the new jacket, they may do so. Local Matches: Our local matches are currently played on our newly renovated courts on school grounds. Improvements are still being made as funds are raised. Out of Town Matches: We anticipate playing in Pineville, Ruston, Neville, and West Ouachita. The team will ride on the school bus to these matches. No Students are allowed to drive to out-of-town matches. Fundraising: Each player will be responsible for selling 2 umbrellas at $20 each to help with tennis expenses. In addition, we are selling banners to help renovate the tennis courts. Click here (have link to pdf document with info and pics) to view donation options.